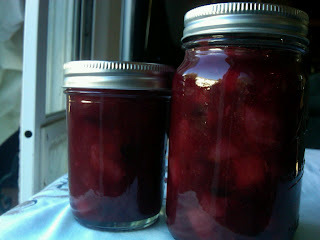 Cranberry Relish - Sweet & Tasty (SF Giants 2-0) - Canning Homemade! The other night I posted the recipe for a Cranberry Apple Pear Relish. I finally got a chance to finish it last night. I had borrowed a cup of Triple Sec for the orange liqueur from my sister. I finished all the dicing and chopping, got the brew on the stove, started the jar water and went to get the Triple Sec and realized that my hubby threw it out thinking that it was a half open bottle of water. I didn't have any other container so I made the recipe without it. It is really good. The bits of apples and pears along with the orange zest came out well with the strong taste of the cranberries. It is a chunky thick relish that is in the running for the Thanksgiving table. My sister is here from Las Vegas and will be doing the taste test tomorrow. I will post the winner that will go on our families table.